Are you looking for a safe and comfortable space to share your thoughts and feelings about death and dying? Death Café is an occasional gathering exploring the boundary, and what lies beyond, over tea and cake. Regardless of your perspectives, all are welcome to this non-sectarian event hosted by Alex House’s community programmer, Neil Fernyhough, who is also a trained pastoral care provider and former social worker. Death Café is part of a worldwide movement whose goal is to “increase awareness of death with a view to helping people make the most out of their (finite) lives” (https://deathcafe.com/). 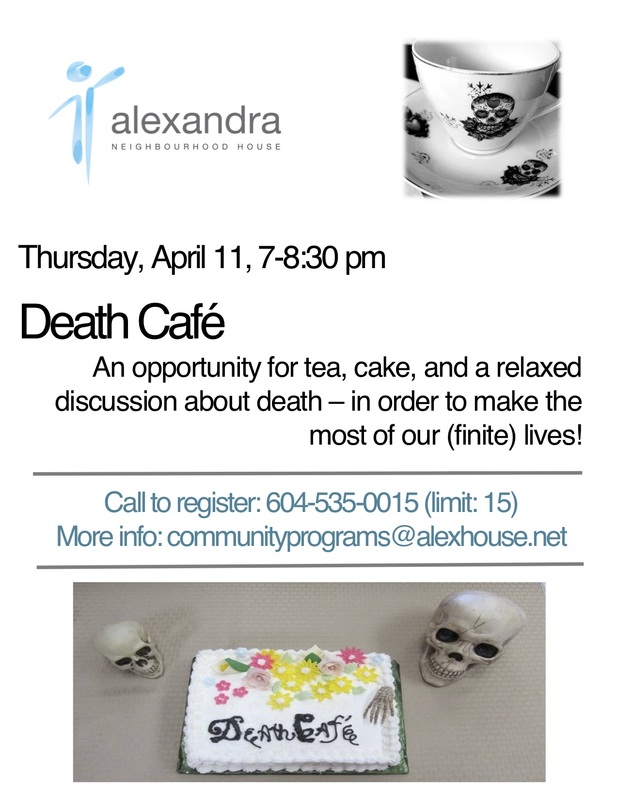 Last January I attended my first Death Cafe at Camp Alexandra in Crescent Beach. The evening discussion was facilitated by Neil Fernyhough, who runs the community programs. He spoke of the concept of Death Cafes and asked us to speak from our hearts. There were eight people attending, a collection of nurses, social workers, a lawyer and others. Sharing tea and treats we had a spirited and powerful discussion often punctuated by laughter and touching moments of sharing. We covered such topics as fear of death, euthanasia, organ donations, type of burial we would prefer and what we would want for our celebration of life or funeral. The concept of Death Cafes began in Switzerland in 2004. Bernard Crettaz, a sociologist felt there was a need for people to get together in a relaxed and comfortable setting and talk in an open and authentic way about death. Death seems to be the last taboo subject, and he believed it was time for it to “come out of the closet”. Jon Underwood, a British web maker liked the concept and began the first Death Cafe in Britain in 2010. Death Cafes have since spread to many countries in the world and are gaining in popularity. Jon Underwood says if we can get together to talk about death openly and honestly we can” say things in front of strangers which are really profound and beautiful”. The Death Cafe website states that the goal is “to increase awareness of death with a view to helping people make the most of their (finite) lives”. For me, it was an inspiring evening. We are all going to die. It is part of life, another transition, another journey. I described being with my mother when she died and that I felt I was giving her death as she had given me life, that I was a midwife for her death process. At that point one of the women in the group said she had read about other cultures having death coaches and asked “would you be my death coach?” I felt quite honoured by her request. Hope to see you there for a lively and powerful discussion. For information about the movement http://www.deathcafe.com. An interesting article on the topic is available in the New York Times.